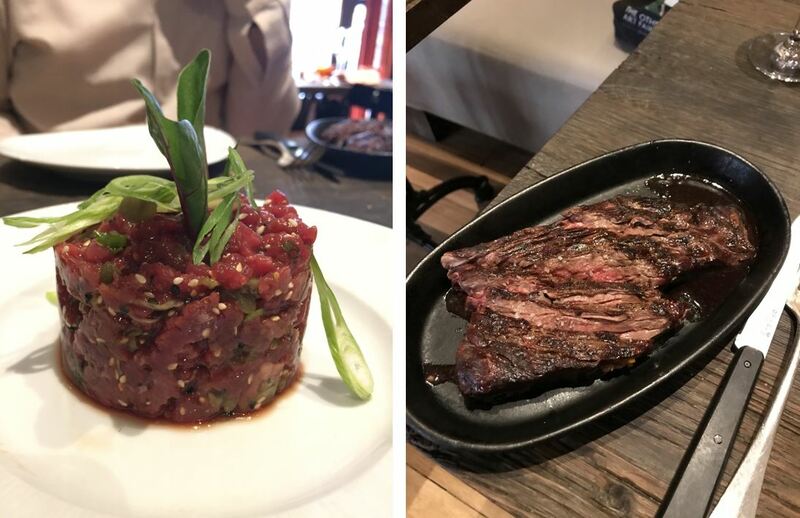 With food trends going the way of vegetarianism, veganism and [insert protein or sugar group]-free inconvenience, it is a refreshing change of pace to come across a venue that unabashedly describes itself as a “meat restaurant”. Fittingly named after a slaughterhouse, Café des Abattoirs, Paris, is a nostalgic godsend to the carnivores amongst our number. Run by the daughters of the Michelin-starred chef Michel Rostang, Caroline and Sophie Rostang, the bistrot à viande recalls their grandfather’s hotel-café in Pont-de-Beauvoisin and stay’s true to the family’s 6 generations of culinary know-how. On entering the dark and cosy venue, we are greeted by the amiable Sylvail, our host for the afternoon. He offers us a seat opposite the kitchen hatch from where we can see busy hands preparing top-tier ingredients, as well as espying the goings-on at the bar. We are presented with laminated menus that showcase the compact offerings of three fixed-price options (32€, 38€ and 45€), to be accompanied by a choice of sides and prefaced by the appetisers of the day. The chalkboard of daily specials is surprisingly made up of entirely foreign meats including Wagyu, Galician veal and Hereford beef. 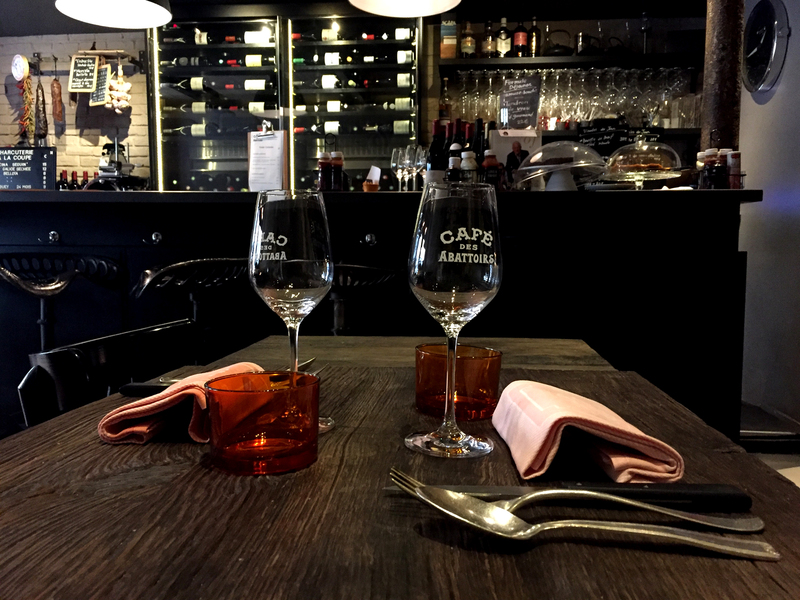 Sylvail explains that Café des Abattoirs, Paris, is the Rostang family’s friendliest venue that encourages the very un-Parisian concept of sharing dishes. With this in mind, we opt for the Charolais beef tartare and a bavette of Hereford beef along with an array of sides. The atmosphere is quiet and decidedly unhurried. 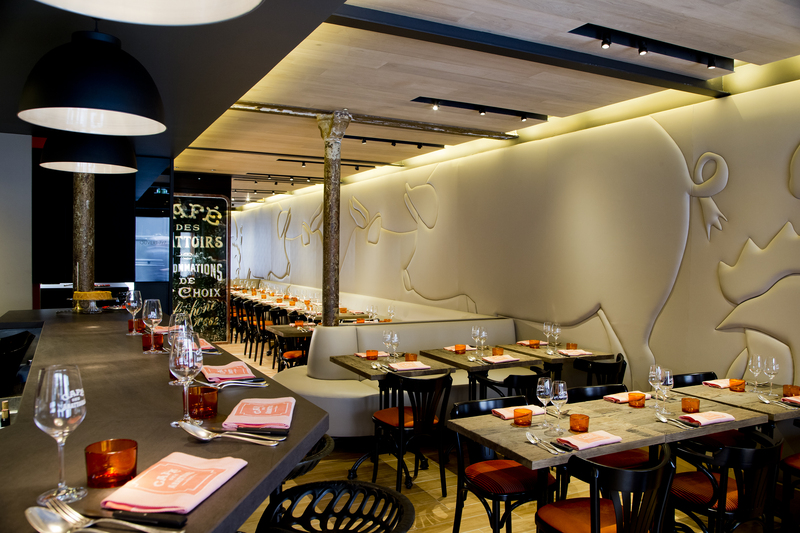 Industrial elements such as rusted support beams and dark metal bar stools are set in contrast with the bright pop of orange in the chairs and the slightly humorous porcine and poultry themes leather wall panels. Quirky napkins that double as bibs and vintage silverware completes the light-hearted, sentimental décor. We are offered to taste the excellent Côtes-du-Rhône (and the tap water – “2013 – an excellent year for water in Paris”) and eagerly await the appearance of the appetisers. The first to arrive is a thin loaf of ficelle bread, followed by a stunningly presented array of pickled vegetables, goat cheese wrapped in bacon, and artichoke soup. 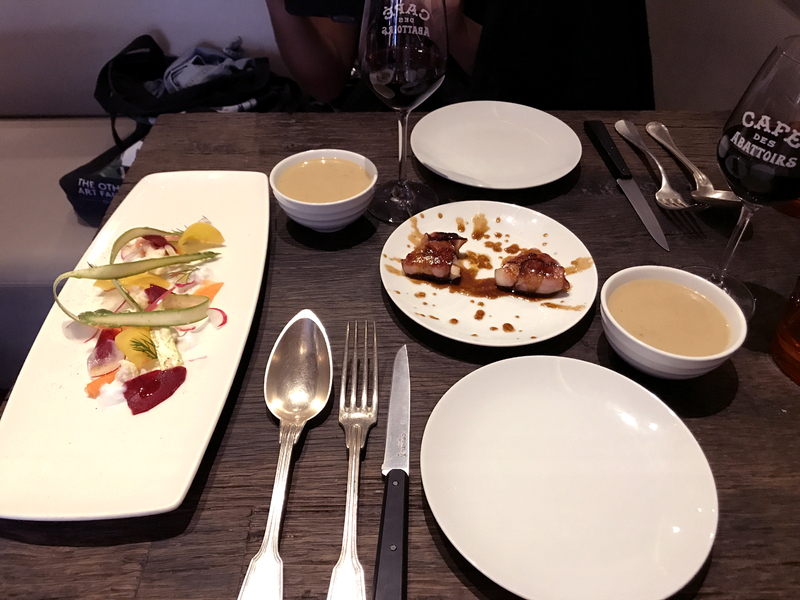 The vegetables dish comprises minutely sliced, sharply vingared, crisp radish, carrots, onions, and winter asparagus, whilst the warm bacon parcels are glazed in honey and meat juices. The soup balances the quartet, as the artichoke connects with the bitter element of the vegetables and the creamy mouthfeel pairs well with the soft cheese. Our mains are equally delicious. The tartare is finished with soy sauce, a touch of green chili, spring onions and mixed sesame seeds, giving it a light Eastern flavour that works wonders. The meat itself has been hand-cut and is delicately chewy. The bavette arrives beautifully rare, with a smoked BBQ taste and the perfect amount of seasoning. Sides of smooth mash swimming in butter, twice cooked French fries and al dente roast vegetables complete the course and leave us clutching our respective stomachs. Sylvail saunters over, obviously pleased with our states of being, and reads out his recommendation of dessert. Under his guidance, we elect to sample the chocolate tart with salted butter, and the Café des Abattoirs, Paris, crème brûlée, which we are assured some say is the best in the world and whose recipe is guarded by dragons, ninjas and superheroes. Unbuckling our belts, we soldier on, finding space in that spare gut corner reserved solely for pudding. The tart is almost mousse-y in texture and rich without being overpowering. 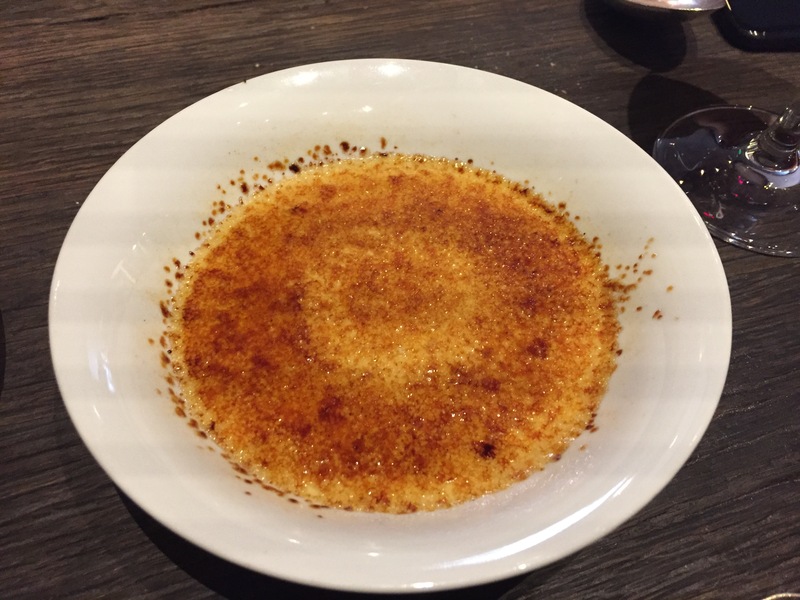 The crème brûlée, however, is the real deal: thick, luxurious and deeply indulgent. There is just the right depth of custard for the light sugar crust and the vanilla bean is present without overcoming the palate. We leave after a leisurely two and a half hour, feeling utterly spoilt and incredibly full. The fantastic service, value for money and relaxed ambience of Café des Abattoirs, Paris, makes it somewhere we would heartily recommend for any meat-eater. Vegetarian are of course also welcome, but as Syvail puts it “it’s better if you eat meat”.